The African Investigative Journalism Conference (AIJC2018) is the premier annual gathering of African investigative journalists – a three-day international conference for and about investigative journalism. It involves skills training, networking, promoting, collaboration and in-depth accounts of major investigative stories. It is hosted by the University of the Witwatersrand, Johannesburg. This year’s conference will feature more than 50 speakers in workshops, panel discussions and networking sessions, as well as skills training in areas such as advanced data analysis and security. Key speakers include award-winning journalists from across the world, and Africa’s best. This is a chance to hear and meet those leading the field and enhance your skills with the latest tools and tips. 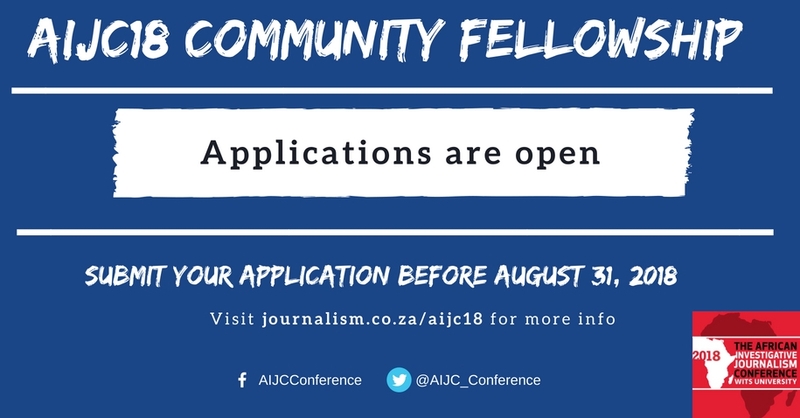 In 2018, 10 places are available to community newspaper journalists who are members of the Association of Independent Publishers and who have an interest in investigative journalism, want to develop their investigative skills and learn from other African and international journalists. Fellows will be required to write an article for publication or make a presentation to their colleagues on their learnings from the conference. The fellowship will cover transport, accommodation for those who need it at The Wedgewood in Melville (www.thewedgewood.com) and transport to and from the conference, meals and conference fees. Following the AIJC, on Thursday 1st November, there will be a one-day round-table run by Wits Journalism’s Africa-China Reporting Project. It is open to those who have worked on or are currently working on specific stories about China in Africa. Please indicate your interest in your application. Applications close August 31st, 2018. Successful applicants will be notified by email by September 14th, 2018. Note: The conference will be conducted in English and there will be no translation.